Well,another pink wallie from me... ^_^' But it's Valentine's Day...everything is sooo pink :) Anyways,happy Valentine's Day to everyone! As you said in your comments, you can see some slight problems with extraction, particularly around the flairs of her skirt, but otherwise the extraction doesn't seem to be a problem. A nice valentines days entry, thank you for submitting it Chi-chan! altough it's valentine...so...pink >_>....allright ^^~!!!! Well, omfg... that looks really cool. I love the scan you used, wish I used that one instead. Oh well. The BG is very... fascinating... but the text could use something more... fitting to suit the wallpaper more. But it's not too noticable anyway... same goes for the extraction of the scan. Great work. Nice job on the background. Being that it is Valentine the color is pink and I like the way you did the stars and flower petals surrounding the character. The grass too is nicely done. Thanks much for making this fine wallpaper. Wheeeeee~! A pink Dark Magician Girl wallie! XD Even though I'm not a huge fan of pink, the scenery works well with different pink colors! :D Great work, chisana! Straight to the favs, not much for pink, but I do like the DMG and it's done very well. Another good one! Thank you for sharing. Looking forward to see what's next. Beautiful XD nice and pink! well there are some great lightening, figure effects in here. all the little petals and sparkles are nice too. You did a really great job! I'm not ot fond of the Yu Gi O thing (i only like the idea behind the card battle stuff) but that is a really good wall. That dark Magician Girl looks really good wall. I like it. Dark Magician Girl finaly I found you. another great wallpaper! thanks! i could never find any good ones until i came here. cute picture! very nice touch with the pink background! very detailed! yeah.. go go dark magician gal! 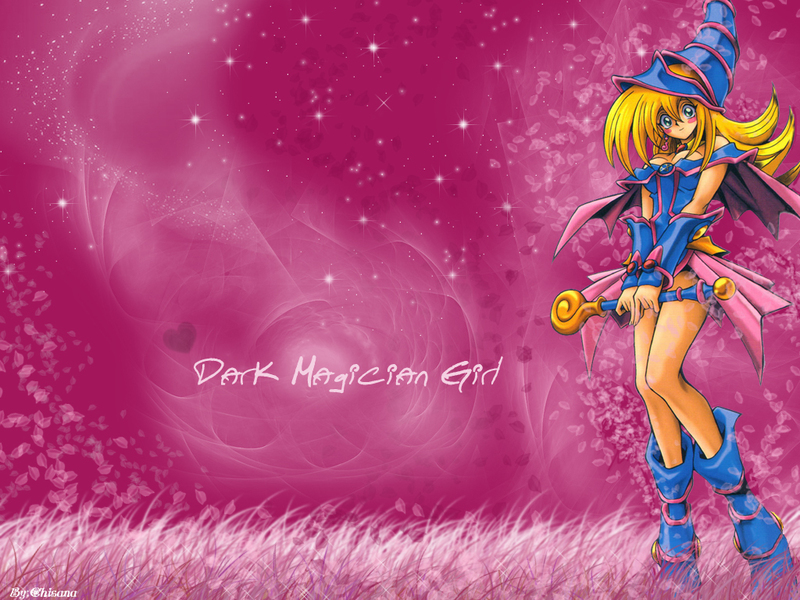 what a cute wallpaper of the dark magician girl you maked there!